As bankers bide their time in Surrey, Octagon are preparing to launch the final phase of their massive seven-year redevelopment of the early-19th century Wall Hall mansion and estate near Aldenham, Hertfordshire, with its 55 acres of parkland laid out by Humphry Repton. From 1910 until the outbreak of war in 1939, Wall Hall was owned by the American banker John Pierpont Morgan, who used it as a shooting box and extravagant party venue during the eight weeks of the season each year. During the war, Jack Morgan lent his house to the then American ambassador to London, Joseph Kennedy, who used Wall Hall as a weekend retreat. In 1943, Hertfordshire Council bought the estate and after the war it became a teacher training college and eventually part of Hatfield Polytechnic, now the University of Hertfordshire. In 2001, Octagon bought the Grade II-listed mansion and its surrounding estate, and built 112 new properties within its 55 acres of landscaped Repton parkland, which is also being restored. 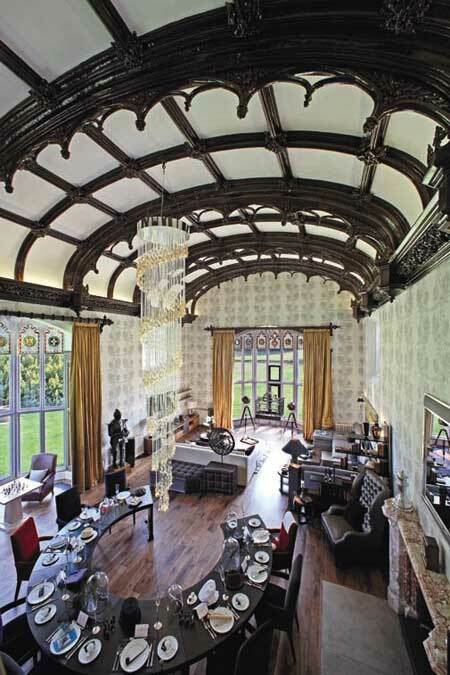 Next month sees the launch of seven carefully restored apartments within the castellated Hall, at prices ranging from £700,000 to £3.6m. The mansion’s showcase apartment, which includes the original Great Room with its barrel-vaulted ceiling, massive kitchen/dining area, huge drawing room, two double bedrooms and master suite with roof terrace, is already under offer. Selling agents Real Estates (020-8445 6387) are busy fielding enquiries for the remaining flats-many, apparently, from members of north London’s Jewish community, for whom Aldenham represents the depths of the English countryside.